Home » Posts tagged "margarita recipes"
National Margarita Day: A Cocktail in the Cold? What do you think of when you think of Margaritas? An ice cold cocktail with fresh fruit (and perhaps a little umbrella!) enjoyed with your toes dangling in the pool? 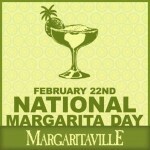 The best time to enjoy a Margarita is: February 22nd!